featuring Les Thompson; Bass/Vocals, Matt Cartsonis; Mandola & Guitar/Vocals, John Cable: Guitar/Vocals. 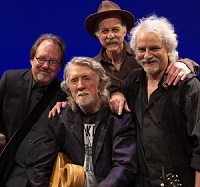 A Nitty Gritty Dirt Band founding member, McEuen initiated what Rolling Stone called “The most important record to come out of Nashville” and what the 2004 ZAGAT survey called “the most important record in country music” – Will the Circle Be Unbroken – named by CMT one of the 40 most important albums Country Music; inducted into the Library of Congress in 2004 and the Grammy Hall of Fame in 2011 as an historic recording. John has made over 40 albums (6 solo) that have earned 4 platinum and 5 gold recognitions, Grammy, CMA and ACM awards, Emmy nomination, IBMA record of the year award, and performed on another 25 albums as guest artist. Tickets: $35 1st Section; $30 2nd Section; $25 3rd Section; $20 4th Section + applicable fees. Lincoln Theatre Members receive $2 off.